Colloidal COPPER Ultrafine 11 12ppm. improve circulation collagen bone strength cleanse arteries varicose veins restore skin. brain 100ml. Ultrafine copper improves circulation, collagen production, bone strength, cleans arteries, reduces varicose veins, restores elasticity to the arteries and veins; and skin helping to dismiss wrinkles. Enhances brain clarity. Essential for the continuing healthy working of the bone-cartilage connection in all joints including but not limited to; spinal connections, knees, hips, ankles, shoulder and arms. From our own tests and studies, when combined with ultrafine colloidal gold, COPPER (Arthritica tm.) can not only help in relieving swelling and pain, but when used in the early stages as a cold compress applied over the affected area, can help eradicate it within five to ten days and give a decade of freedom from this dreaded arthritis. Extreme benefits can be obtained in the relief of pain when applied topically to the affected area and further long term benefits arise from an oral dosage of one teaspoon daily. This can have the effect of creating more elasticity within the walls of the arteries and veins and make them more flexible providing more dilation as well as helping to cleanse blood by increasing oxygenation throughout the blood system. Potential Prevention of Aneurysm, Stroke, Heart, Thrombosis. Ultrafine Colloidal Copper is the Skin's best friend because of the following benefits it bestows on and within the skin and sub-derma layer. Increases the skins elasticity and thus smooths out tiny wrinkles around the eyes, lips and neck. Promotes and instigates healthy collagen re-growth below the skin in the sub-derma area. This also adds to the eradication of wrinkles, drooping and sagging skin. Causes full oxygenation of the blood within and just below the skin giving it a lustrous and healthy glow. Increased oxygenation coupled with elasticity can vigorously contribute to the eradication of certain causes of Acne especially when used in conjunction with ultrafine colloidal silver such as Alchemists workshop's SKIN I. When ultrafine colloidal copper is administered using a pipette dropper to the nasal passages, it's almost nano-sized particles can easily be absorbed through to the brain where it speeds up the synapse response and thus lead to faster and clarity of thought process. The same response is also experienced when taking ultrafine colloidal copper orally - but with a slight time delay and also to a lesser extent. Warning: the oral dosage should not be exceeded and in certain cases it may be necessary to start with one quarter of a teaspoon every two days working up to the daily dose over two weeks. People suffering epilepsy or other types of brain spasm are advised to consult with their medical doctor before using colloidal copper. Way back when, - in the mists of time, copper was used for its medical benefits. Originally, it was found that when used for bracelets or neck torques, pain caused by rheumatism was either diminished or eradicated. They noticed the discoloration of the skin caused by the copper's oxidization which was accelerated by the interaction of the natural chemical reaction of poisons moving from within the body through the skin and inter-reacting with the worn copper items. Between 3500 BC and 1500 AD copper was ground down to a very fine powder and used as a method of treating internal parasites living within the human body. The ancients in both China and Egypt used copper to slowdown and or even reverse the greying colour of hair. 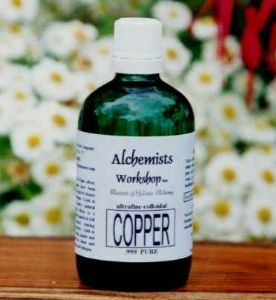 From the Middle Ages the Alchemists sought out the benefits of using copper as one of their medical metals and although they strived more with the use of gold (the sun) and Silver (the Moon), copper was still held in the greatest respect for its medical qualities in treating joint and muscular conditions. So over a period of over 5500 years the use of copper both in treating illness, disease, infection of parasites and use for cosmetics and beauty treatments has persisted. It is now in the first decade of the 21st century that holistic alchemists have the ability to create ultrafine colloidal particles of copper tiny enough to pass through the entire human body without any risk of toxic build-up. Their use in matters concerning heart, arteries and veins: stroke and aneurysm; elasticity for skin, muscle and joints, arthritis and more is overwhelming. ( i ) Early in 1985 Dr Robert Becker (author of - The Body Electric) discovered during research, that in all cases he dissected concerning osteoporosis - the common denominator was that there was one missing element bonding together cartilage to bone and that was a single copper molecule. - In all healthy joints not affected, the copper molecule was present acting like a chemical magnet.